Sunny and Mini Me aka SunSun and MinMin were born in our care July 17, 2014. Their mom had just had a litter a few months before they were born and did not have enough milk for her 5 new kittens. So we helped out with some bottle feeding. 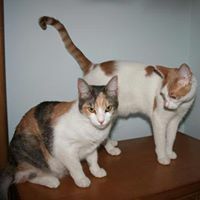 Sunny and Mini were perfect and were adopted into a family together. When they were just about 18 months old the family could no longer keep them and they came back to the foster home. Unfortunately they were no longer used to living with multiple cats and were anxious to be back in foster care. They began urinating inappropriately around the foster home. We feel that this behavior will stop once they are the only pets in a loving home. They are extremely bonded, very loving, friendly and sweet! It would be wonderful if someone would give them a second chance.